Thai House & Sushi Bar Is Located In the Heart of St.Augustine Historic Downtown. Offering Modern & Authentic Thai And Japanese Cuisine In A Stunning Space. Thai House & Sushi Bar is a great place to unwind with an extensive list Of wine, beer & sake to accommodate a wide range of tastes. Live music is available at the venue as well as a small private dining room for parties of 6-12 people. Our friendly and professional staff will assist in making your dining experience truly memorable. Grilled Marinated Chicken, Peanut Sauce. Breaded shrimps skewer! Served with sweet plum sauce. Marinated Mixed Vegetables & Bean Thread In Crispy Rice Wrapper. With Thai hot chili-garlic sauce. Cooked chicken, lettuce, cucumber, carrot, celery, mushroom wrapped in rice paper. Made from boniato, coconut, flour and served with Thai special sauce. Imitation crab, cream cheese, black pepper then fried and served with sweet plum sauce. Served with a delicious dip. Shrimp-filled dumplings, deep-fried and served with hot mustard. Pastries stuffed with seasoned meat: served with a spicy dipping sauce. Octopus, Conch, Kanikama and Cucumber in tangy rice vinegar. Conch or Octopus and Cucumber with Spicy Sauce. Seared on the outside, raw on the inside served with ponzu sauce and scallion. Chop tuna mixed with scallions topped with avocado. served with crispy fried wonton. Choose one of our popular dressing: peanut or ginger dressing. Green Papaya, Shrimp, Carrot, Tomatoes, Lime Juice, Garlic, And Peanuts Tossed In A Thai Vinaigrette. Sliced Grilled NY Strip Stake, Lime Juice, Tomato, Onion, Scallions, Cucumber And Greens. Tuna or salmon, cooked spinach, cucumber, scallions, avocado and special sauce. Green seaweed pickled in sake. Miso broth, tofu, cut seaweed and scallions. Mushrooms, lime juice, lemon grass, chili paste, coconut milk and scallions. Mushrooms, lime juice, lemon grass, chili paste and scallions. Broccoli, Bok Choy, Mushrooms, Carrot And Zucchini. 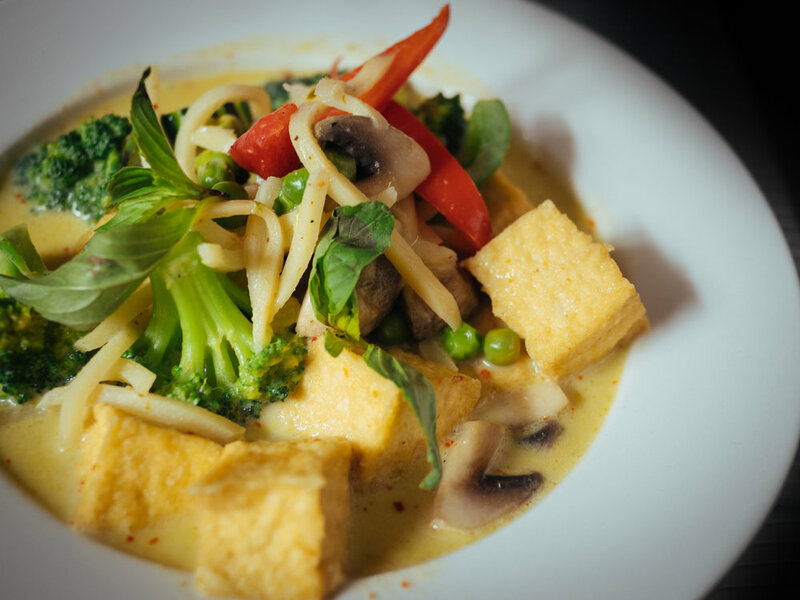 One Of Thailand’s Classic Curries, The Red Curry Paste Is Combined With Coconut Milk, Bamboo Shoots, Sweet Peas, Red Bell Peppers, And Thai Basil. A Southern Thai Curry With Indian Influences, This Curry Has Aromatic Spices Such As Cinnamon, Cloves And Cardamom With Potato, Peanuts And Avocado. Rice Noodles, Egg, Bean Sprouts,Scallions, Peanuts. Rice Noodles, Onion, Tomato, Bell Pepper And Basil Leaves. Onion, Scallions, Zucchini, Broccoli, Bean Sprouts, Carrot and Egg. Eggs, Onions, Scallions And Basil Leaves. Chicken, Beef, Imitation Crab, Shrimp, Eggs, Onion, Scallions. For vegetable lovers. Asparagus, Carrot, Avocado, Spinach, Snow Peas And Cucumber. Pacific Yellowtail, Asparagus, Avocado, Scallions. California Roll with a rainbow of fish on the outside. Mixed Cooked Seafood, Japanese Mayo, Masago. 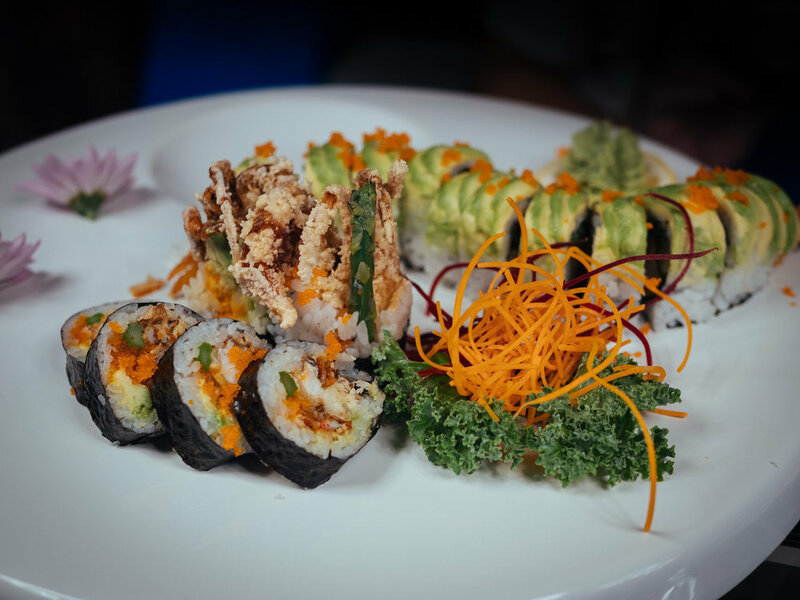 Shrimp Tempura, Avocado, Cucumber, Scallion, Lettuce, Spicy Mayo, Masago Rolled Inside Out And Topped With Avocado. Half Roll Tuna, Cream Cheese, Scallions, Avocado Other Half Eel, Avocado, Scallions, Masago Rolled I/O. Spicy Tuna, Cucumber, Tempura Flakes, Lettuce Wrapped In Rice Paper. Tuna, Tempura Flakes, Avocado, Spicy Mayo, Tobiko. Shrimp Tempura, Avocado, Mayo, Asparagus, Scallions Topped With Kanikama, Tempura Flakes Splashed With Spicy Mayo & Eel Sauce. Spicy Tuna, Avocado And Tempura Flakes I/O Top With Fresh Tuna, Jalapeño And Splashed With Kimchee Sauce & Eel Sauce. Spicy Salmon, Cream Cheese And Tempura Flakes Wrapped With Soy Paper, Topped With Tuna & Avocado. Spicy Tuna, Cream Cheese And Tempura Flakes Wrapped With Soy Paper, Topped With Salmon. Shrimp Tempura, Avocado, Mayo, Asparagus, Scallions I/O Topped With Spicy Tuna. Shrimp Tempura, Avocado, Cream Cheese Rolled I/O Topped With Eel And Tempura Flake. Shrimp Tempura, Avocado, Asparagus, Eel & Cream Cheese Topped With Seared Tuna, Tempura Flakes, Masago & Scallions Splashed With Spicy Mayo & Eel Sauce. Tuna + White Fish, Yellow Tail, Cream cheese, Avacado, Scallion, Deep-Fried. Topped with Jalapeño and Special Sauce. Red + White Fish, Yellow Tail, Cream cheese, Avacado, Scallion, Deep-Fried. Topped with Jalapeño and Special Sauce. California Roll, 7 Pieces Of Sushi. Vegetarian Roll, 5 Pieces Of Sushi. A Variety of 9 Pieces Of Sushi. 6 Pieces Of Sushi & 6 Pieces Of Sashimi. A Work of Art. A Variety of Toppings Arranged On Bed Of Rice. California roll, JB roll & Tuna roll. A Fillet Of Eel Served Over Rice With Sauce. A Combination Of Fresh Fish, 16 Pieces.